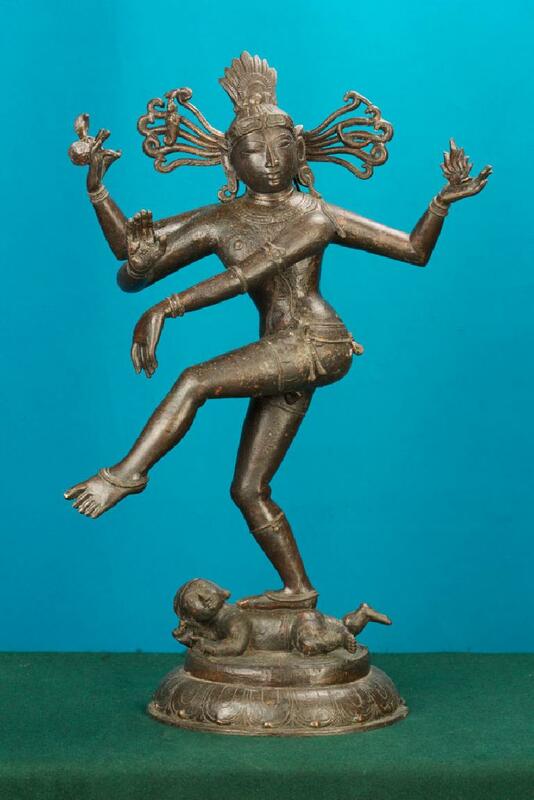 Nataraja is Lord Shiva’s cosmic ecstatic dancer form. The dance of Nataraja is called Thandava or Nadana. Here, the four handed Nataraja is standing on Apasmara. Mythology pictures Aparsmara as a dwarf who symbolises ignorance and epilepsy. Apasmara is a demon destined to be immortal and because of this quality, he is suppressed forever by Lord Shiva in his Nataraja form. A notable characteristic of the sculpture is its fan-shaped headdress. Ganga and Chandra are depicted on both sides of the Jata. Flame is visible in one hand and the other holds the Damaru surrounded by serpent.